What is it about the prospect of eating outdoors that conjures up thoughts of anything from a simple sandwich to the most elaborate meal? As I contemplate a present day picnic menu, I am reminded of a couple of picnics past... one silly, both memorable. About thirteen years ago, my husband uprooted me from the place I had grown up to move halfway across the country, as he began a new job. I, still traumatized by the move was not in an entertaining frame of mind. 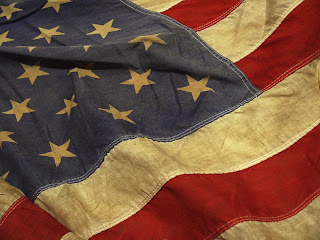 But, we were invited to attend a picnic at a very large local church, celebrating our nation's birth. With two bored kids, stuck in a company apartment, we loaded up. With most belongings still in storage, I half-heartedly dragged out an old quilt replete with stains and holes, along with a couple of rusty beach chairs. Our family of four, dressed in matching Old Navy flag tees, drove through a Backyard Burger. The place we settled was near a large group of people who had obviously attended this party before. The neighboring crowd had a large, lovely canopy to shield them from the blazing July sun. Tiki torches, burning citronella oil, ringed the little camp. Who in the heck were these people? A hibachi grill was searing about a dozen shish kabobs and a table complete with large umbrella, covered with a watermelon print tablecloth held a fruit platter, a cheese tray, assorted crudites, a patriotic flag dessert and beverages in a galvanized basin filled with ice. Are these the gypsies I've heard stories of? Do they live in this spot year round? 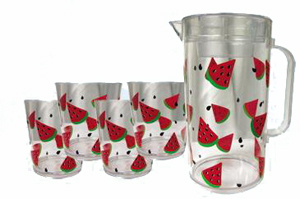 They had matching watermelon themed picnic ware. The hostess, who truly WAS the most-est I had ever seen was dressed to match her picnic theme. 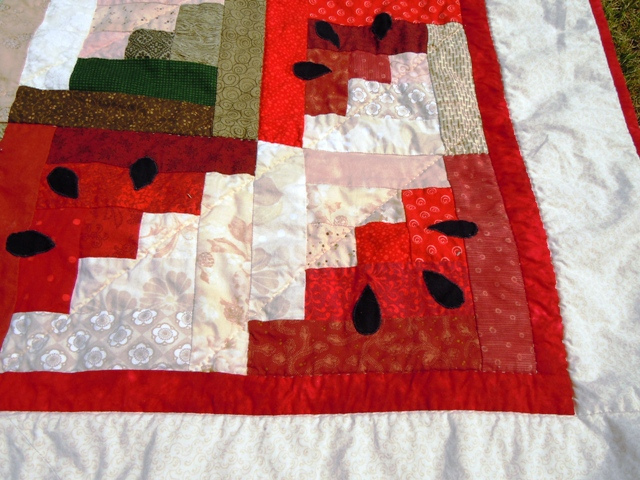 Even the quilt on the ground was, you guessed it... a watermelon pattern. The group's silent inspection of our hole-y quilt, rusty chairs and paper bag fare spoke volumes. Without uttering one syllable, they gave us a knowing look that said, You aren't from around here, are you? We enjoyed the evening, but I vowed to either never be ill prepared again... or pay closer attention to my picnicing neighbors. 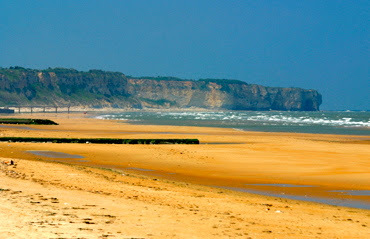 A few years ago, while on a student trip to England and France with my eldest daughter, we were treated to a picnic on, of all places, the beaches of Normandy! Yes, yes, THE Normandy. In France. Location of the D-day Invasion. The beaches are rough and rocky, with jagged high cliffs and shiny, golden sand. A quaint country inn near the town of Le Havre provided our group of 200 with sack lunches, each consisting of a long, crisp, freshly baked baguette, sliced and buttered, filled with thick cut ham and a very robust Swiss cheese; a shiny red apple and bottle of water. As we dined on the rocks, looking out over the shore, remembering those who had given their lives on that very beach so many years ago. After lunch, with the waves licking at our toes, my girl and I explored and collected a few smooth stones. Today, six years later, those stones reside in a hand-carved wooden bowl. That rustic picnic remains one of my favorite memories. The freshly baked bread, the crisp ocean air, the history of that place and the company of people I love. Grand and accessorized, elaborately themed or simple and stark. 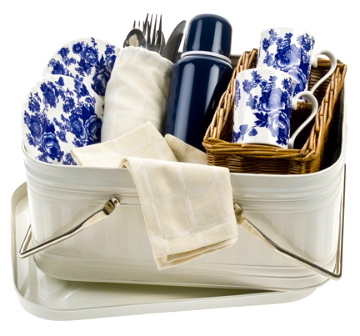 No matter the food or location, a picnic is a lovely way to enjoy a meal. It is a way to unplug, unwind and reconnect with friends or family. As the days become shorter and the air gets cooler, plan a little outing of your own. Visit a historic battlefield and learn something new! Find a free outdoor concert and pack a lunch. Plan a romantic dinner by the shores of a lake or river. Get out a REAL tablecloth. Dust off your grandma's china. Use real forks. Make food from scratch. Add your favorite people and let the conversation and laughter flow... make some memories! Hilarious story about the church picnic! A historic battlefield with lace napkins and good china, Blue Willow to be exact, and real silverware...lovely. Lovely. You have an awesome blog, Food Maven! Yes, the reference was to a picnic inShiloh, Tennessee at the Battlefield, on the bank of the river. One of my favorite days!